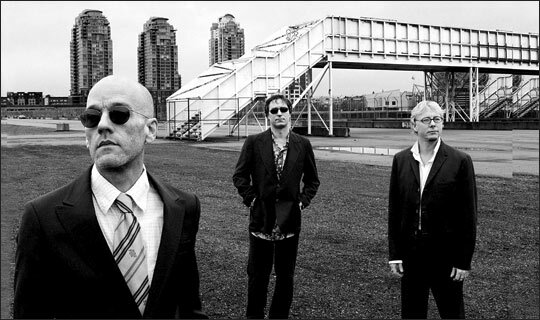 Alan O’Hare explains why Up is possibly REM’s most important record to date. It was the fur coat and sunglasses that did it. 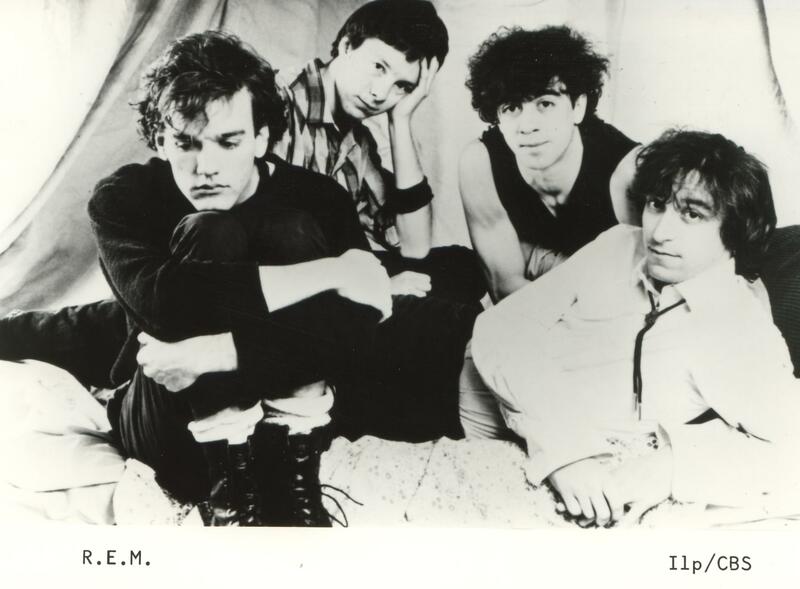 When REM toured Monster back in 1995, I was 15 and pleaded with my Mum to let me go – the band had become mine in the preceding couple of months and it was all down to the enigmatic Michael Stipe. I was obsessed with him. Loved him, even. Still do, truth be told. Anyway, I didnÃ¢ÂÂt end up getting there – my older friends all went to the McAlpine in Huddersfield and came back with tales I didnÃ¢ÂÂt really want to hear. Ã¢ÂÂYes, they are that good,Ã¢Â? etc … Bastards. Fast-forward around three years and REM no longer occupy all of my time – other, more simple props, like Oasis, Shack and various great bands from the North of England are on my radar these days and I no longer walk around singing ItÃ¢ÂÂs The End of the World all of the time. MichaelÃ¢ÂÂs picture still has pride of place on my wall though – two, to be precise: the famous Ã¢ÂÂBuck, Mills, Berry, MeÃ¢Â? one and (outside of any images featuring Springsteen and his Telecaster) my favourite rock image ever: Stipe in the water, from Automatic For The People. Then came Up. Well, first was an MTV clip of the new, Ã¢ÂÂthree legged dogÃ¢Â? REM, opening their set – in a stadium, I might add – at the Tibetan Freedom Concert, with Airportman: all lush keyboards, funny noises and Brian Eno craft. I hated it – and Stipe looked stupid in a skirt too. 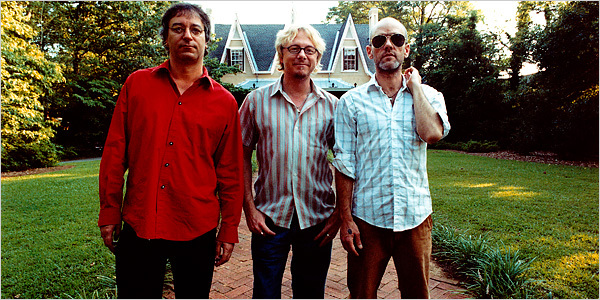 News was coming through of the much-anticipated new record – their first without drummer and songwriter Bill Berry – and the word was, that they had struggled. I felt like Bertis Downes probably did when he first heard Airportman – I was shitting myself, in case one of my old favourites werenÃ¢ÂÂt gonnaÃ¢ÂÂ cut the mustard anymore. Up worked its way inside my heart and soul something wicked – itÃ¢ÂÂs a real headphones album and not one to be sat through at the stereo. So, night after night, I fell asleep with it. I remember thinking it was different at first – but completely REM-sounding and I couldnÃ¢ÂÂt figure out why … until the band performed the singles Daysleeper and Lotus on the likes of TFI Friday (RIP) and Later and the penny began to drop. MichaelÃ¢ÂÂs voice – itÃ¢ÂÂs more REM than any Mike Mills harmony or Peter Buck Rickenbacker riff and IÃ¢ÂÂm talking about vocals and guitar lines that have changed my life here, too. Songs such as the snake-like Suspicion, the declaration of faith that is Walk Unafraid (‘I was brought into this world a little lamb / … now IÃ¢ÂÂll Walk Unafraid‘) and At My Most Beautiful (‘I count your eyelashes … secretly‘) became my best friends. Indeed, At My Most Beautiful charmed its way inside my heart so much, that it became my favourite ever REM song. Until I listened to Find The River again. Or Nightswimming came on the radio. Or … well, you get the point. 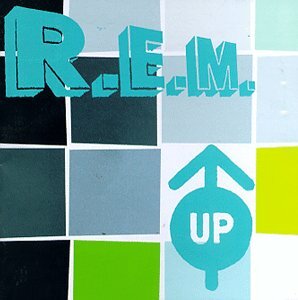 Up gets a hard time these days – but itÃ¢ÂÂs possibly the most important REM album ever; think about it: after Berry left, they could have called it a day and they went through enough crap making it, that friendships nearly ended and that would have been the end. But it wasnÃ¢ÂÂt – and itÃ¢ÂÂs because StipeÃ¢ÂÂs singing was like a deep, dark and truthful miror, that made the songs on Up sound as vital as they had to be, as the group headed into a new Millennium. Ã¢ÂÂGreat opportunity …Ã¢Â? Stipe sings on Airportman (I love it these days, by the way!) 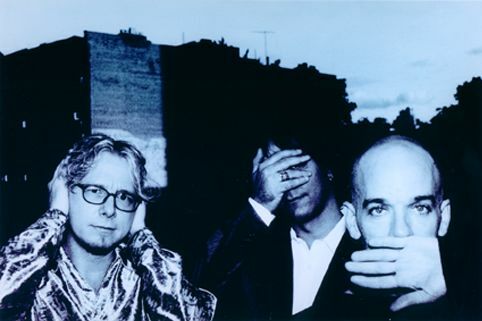 and thatÃ¢ÂÂs exactly what 1998 and Up proved to be, for REM.